Education is part of Apple’s DNA, Phil Schiller said back in 2012 when he took the stage at the Guggenheim in New York City (the venue of Apple’s education event). The company’s microsite dedicated to education is continuously updated with new success stories of Apple products used in education, and more recently, in an effort to ease the implementation process, a new set of guidebooks designed to help educators use iPads in the classroom was released. 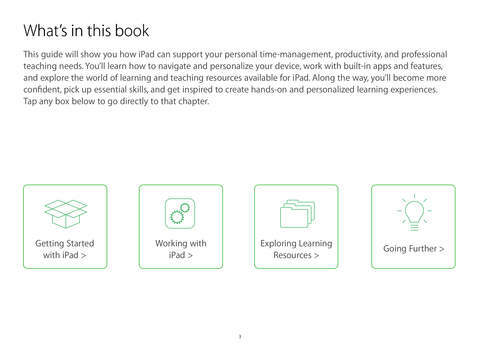 Spotted by AppleInsider, Apple Education has released six starter guides through iTunes U. The new series includes an iPad Starter Guide for teachers new to the device, which offers guidance on how to navigate and personalize their tablet, and work with built-in apps and features, and explores learning and teaching resources available for the iPad. The microsite dedicated to education also offers various examples and success stories under the “Inspiration for Teachers” tab. The starter guide(s) are available as a free download from the iBooks Store.